The circuit I suggested and posted here http://electro-music.com/forum/post-203237.html#203237 gave me some trouble. Not only was upward sweep much greater than downward, but no matter how I tinkered with the values, with the Sweep potentiometer centered (zero sweep, equal amounts of "up" and "down",) I couldn't get the frequency to stay the same with maximum CV and zero CV. All that remained was to get the centered position of SWEEP to give the same frequency with or without a CV applied. A resistor to ground at the "up" end of the pot, forming a voltage divider, took care of that. (A trimpot here to get zero sweep precisely in the center of the pot's rotation might be a good idea.) Values shown are for a 9V supply. It's highly probable that values will need adjusting for a lower or higher supply voltage. If the modulating signal is an LFO's triangle or square wave, there isn't much difference between up sweep and down. But if the modulation is a ramp (sawtooth) or, better yet, an envelope, then adding the extra few components becomes worthwhile. 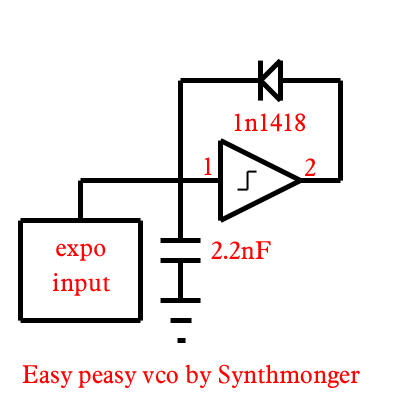 My 40106 vco has expo control (could be modded for linear) and produces a ramp and super narrow pulse waveform. I thought the lunetta didn't use transistors though? Care to provide more details? Pin 1 = ramp pin 2 = super narrow pulse, similar to the bugcrusher vco. I used a ghetto NPN/PNP expo arrangement and it worked well. I didn't test tracking or anything, but the range is huge. Obviously some sort of buffers will be needed. You can get a linear response and other goodies by using any typical cv source found on cgs, mfos, google, etc. I added a sloppy sync using a transistor as a switch between pins 1 and two but it cuts out at times and is just too sloppy. I need to fix that. My lunetta type vco is a bit whacky. I really wanted a phat square wave and was only able to get it by using a frequency divider. I ran the narrow pulse into a 4024 and it's first two sub octaves each through a pair of 40106 gates to get the old fashion PWM trick. To get use out of the other 5 sub-octaves I mixed them together seperately and XOR'd them with a 4030 for staircasing and neat harmonic effects. there was a BIG thread on using inverters with expo converters...based off of ideas inspired by bissells article in EDN. i dont know the thread off hand but i will get back to you. i was doing it a little differently than synthmonger but we both got interesting results. Thanks, loss. I wasn't too interested in expo-control for my purposes, but that circuit certainly looks simple enough to try. But it's bipolar. Can it be made single-supply? As for having up/down sweep, I wanted to keep an already simple circuit simple, and not resort to an op amp attenuverter, which I didn't know how to do in single-supply anyway -- until recently. Yes 'monger, I knew there's a triangle at the gate input, but I thought it had to be buffered by a high-impedance op amp. I assumed a garden-variety transistor wouldn't be good enough. I'll have to try that, too. i dont think its straying too much...because in the end many of us are adding these creations or mods to our lunetta systems. i think as long as its inspiring us to think about new ways of approaching Logic chips and weird noises, all the better. you ever noticed how many amazing ideas have come up on the lunetta forum? Just read this one, now. The CV input, has 2 separate inputs. 1 is from external to the VCO. The other, is a voltage divider between + voltage and Ground. It's the VCO's 'Frequency' / 'Pitch' control. The resistors' values were painstakenly selected so that with the Sweep pot centered a CV will not send the freq up nor down. Move the voltage divider pot out to the 100k and the changes might work. In my view, Lunetta can be whatever you want it to be using whatever parts you have or like. The most important part of the Lunetta paradigm, in my opinion, is FUN. If you're getting that, you're doing it right. Make modular synthesizers great again!